The tiny city of Roy has just under one square mile of land and less than 800 residents. The unincorporated land surrounding the city itself has many more residents and plenty of land area, including working farms and ranches. It is a part of Pierce County in western Washington and is adjacent to the south side of Joint Base Lewis-McChord. 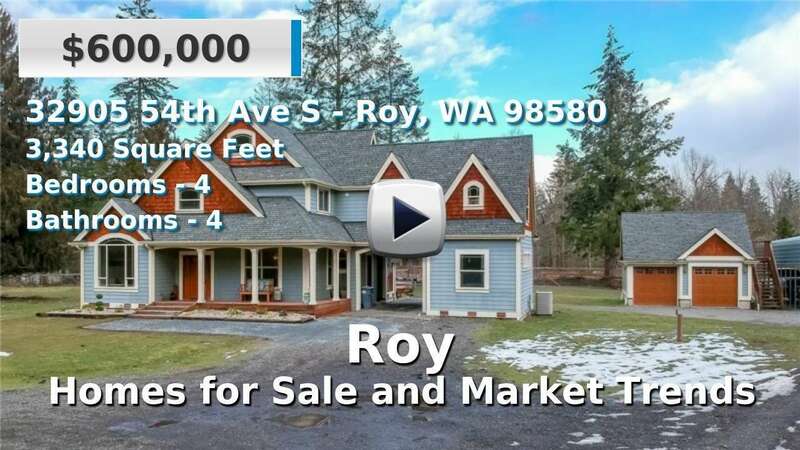 Homes for sale in Roy offer potential buyers a variety of housing development and acreage type settings, with smaller, well-established single-family residences to custom built estates. Neighboring communities include Yelm and Elk Plain, and the numerous lakes and rivers are known for their excellent fishing. 4 Beds | 2.5 Baths | 1617 sq. Ft.
4 Beds | 2.5 Baths | 3112 sq. Ft.
4 Beds | 3 Baths | 4198 sq. Ft.
3 Beds | 2.5 Baths | 1448 sq. Ft.
5 Beds | 3.5 Baths | 3520 sq. Ft.
3 Beds | 2.5 Baths | 1568 sq. Ft.
5 Beds | 2.5 Baths | 2776 sq. Ft.
3 Beds | 2.5 Baths | 2194 sq. Ft.
3 Beds | 3 Baths | 3558 sq. Ft.
3 Beds | 2 Baths | 2460 sq. Ft.